In short, the simpler the ingredients, the better! 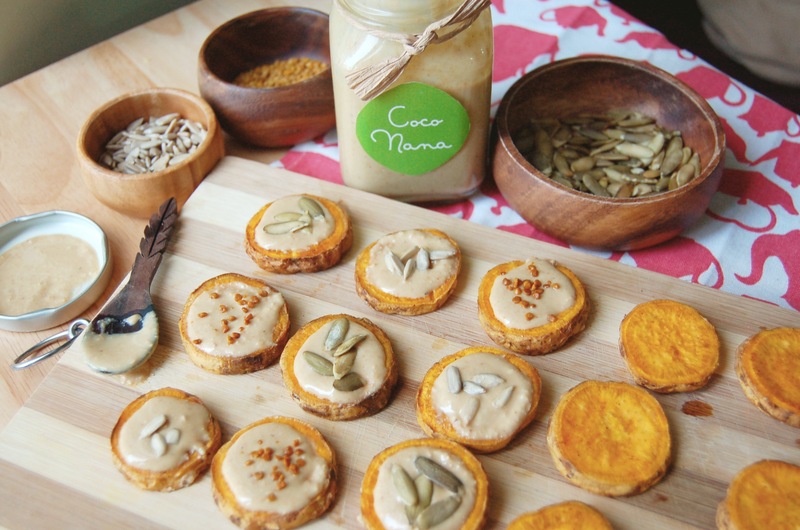 The Coconana cashew butter I used only has 3 ingredients: cashews, pure coconut oil & sea salt. They can add coconut sugar for those who like it, but I requested to opt out (I don’t think it needs it!). Sometimes I’m guilty of buying foreign products as it’s hard to come by certain ingredients here in the Philippines. However, it is much better to buy local when you can, for both the economy and for the environment. Not only do we lessen our carbon footprint by avoiding unnecessary shipping, but we’re also supporting local businesses and farmers. So in excitement and celebration I decided to make some sweet potato rounds! Such a simple but deliciously filling snack. Slice the sweet potato into bite size coins. In a bowl, mix the sweet potato with the coconut oil and cinnamon. Salt to taste. Roast for 20 minutes at 200 degrees celsius, flipping them over half way through. Let the sweet potatoes cool to room temperature, top with cashew butter and sprinkle on your favourite toppings. I’m a big fan of sweet potatoes, but never before had seems them prepare like this. They look yummy!